Being placed on an express checkout when you: A) Haven’t been at work for four days and B) Have never worked express before, is as pleasant as stubbing your little toe on a table leg and as disorienting as riding one of those spinning, circular things at the park. On express you get the worst of two worlds. Firstly, there’s added pressure on you to process items quickly. Secondly, there is little time to talk with customers. And talking is probably the best aspect about my job. (I refrain from saying ‘the only good aspect’). But despite these factors, I nevertheless managed to hold a couple of reasonably interesting conversations. One man who I served bought around 25 tins of cat food. As per usual, when someone buys a medium to large quantity of pet food, I ask how many cats or dogs they have. Yesterday, there was one couple, whose purchases were 90% cat food (total coming to around $30) told me that they owned two cats and fourteen kittens. Anyway, the man with the 25 tins of cat food said that he only had one cat. I commented that pets seem to have a huge variety in food these days, eyeing a can of seafood flavoured meat as I said this, and the customer agreed. He added that his cat was very fussy. As I processed the transaction, I thought about the cat that I had hit with my car the other day and hoped that it wasn’t his. I was driving down my street, some way from my house, when this black and white cat jumped in front of me. It had been standing on a grassy patch just before the curb next to a man in a green shirt and as I approached it looked at me with some trepidation but decided to dash across the road nevertheless. It wasn’t fast enough, however. As I passed the man (who fortunately hadn’t chosen to cross in front of me with the cat), I knocked the cat with my front bumper. I hadn’t swerved to one side because I thought that there would be a worse result – I might run it down flat with a tyre. And I hadn’t braked suddenly because there was no time to. It all happened very quickly. I saw the cat spring up, then heard a thump. I slowed down and stopped a few paces ahead, looking in my rearview mirror to see if the cat was alright. There was a black lump in the middle of the road which was still for a moment, but then it leapt up and ran underneath a parked car on the opposite side of the road. The man who had been standing next to it followed it calmly to the car, opened the passenger side front door, got in, and closed the door – without checking the cat. Because of the man’s indifference and because the cat had gotten up, I thought that there was little point in me reversing back to the scene of the crime to check on things. So I put the car in motion again and drove off. With the thought lingering in my head that the person standing before me could have been the man I’d seen on my street, I scanned, bagged, and processed the transaction. The customer didn’t seem perturbed, though, so I decided that he wasn’t the same man. But then again, the man from my street hadn’t seemed perturbed either. I just realized something. 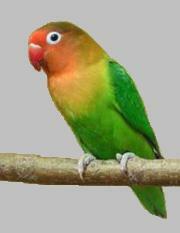 My Fischer’s lovebirds’ plumage corresponds with all the different shades of capsicums. Firstly, their rouge-coloured beaks are indicative of red capsicums at their finest. The dark green of their backs mirrors that of the green capsicum in any season. Their yellow and orange breasts reflect perfectly the yellow and orange capsicums. The light yellowy-green fluffy down of their bellies is the exact shade of a type of bullhorn capsicum. Their heads, capped mustard brown, are the colour capsicums turn as they get old. And, finally, the black tip of the tail of my other lovebird is the same charcoal black of a capsicum that has been charred on a barbeque or over a flame. Any colour capsicum would do for this one.